Product code: T840 Categories: Art Deco, Art Deco Rings & Art Deco Engagement Rings. Here is such a fabulous hand made diamond engagement ring from the Art Deco era that is not only set with genuine antique mine cut diamonds, but also made with such an incredible design. Art Deco jewellery of the 1920’s to the 1940’s resulted in a style of jewellery that has remained popular throughout the ages, and remains the most popular era for engagement rings. 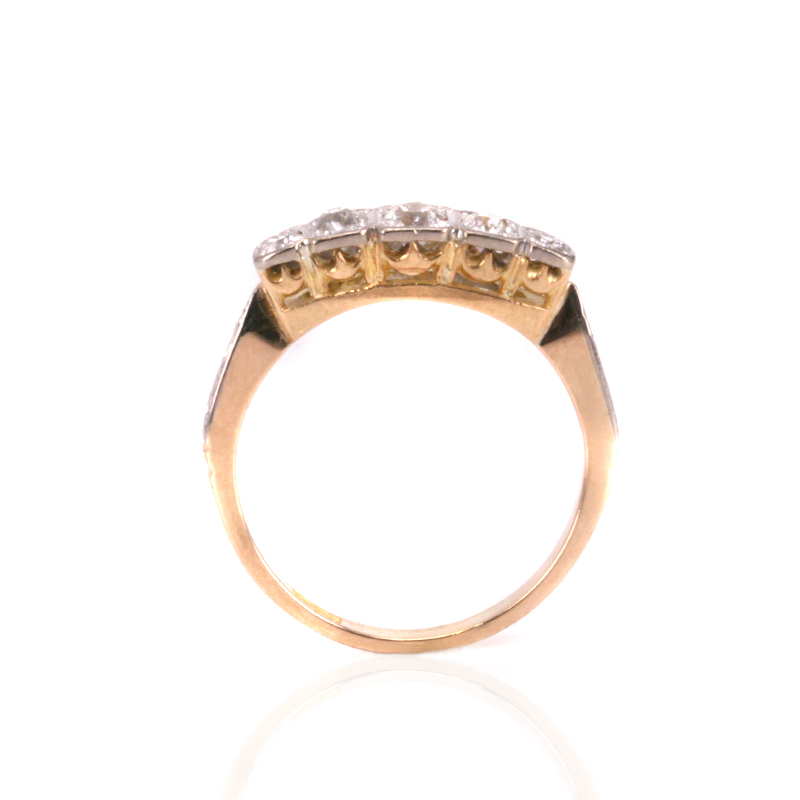 This one was hand made in 18ct yellow and white gold and features five mine cut diamonds with a larger one in the centre then the others graduating down in size. With a total weight of 0.50 carats, they are F to G in colour and Vs to Si in clarity and not only have all the charm and uniqueness of being mine cut diamonds, however the setting is just so wonderful to admire. With a white gold setting, this white gold aspect is also carried down on each shoulder with the most stylish and elegant shoulders that were hand engraved for that added extra. Measuring 4.7mm wide at the centre by 16.3mm from left to right, this is such a perfect example of an Art Deco diamond engagement ring that will always be loved and admired. Set with antique European cut diamonds, this Art Deco diamond engagement ring is so beautiful to admire. With five graduating mine cut diamonds, this diamond engagement ring will easily sit well with a wedding band. Art Deco diamond engagement rings from the 1920’s to the 1940’s have always remained so popular to this day thanks in part to the fabulous quality and designs.